Rail chiefs "completely failed" to follow advice given after a broken rail incident a year before the Hatfield train crash, the Old Bailey has heard. 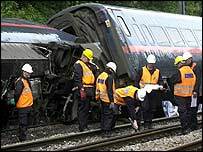 Four people died when a London to Leeds express derailed in Hatfield, Herts, in October 2000 after a stretch of track broke apart as the train sped over it. Had recommendations from an incident in 1999 been followed "the crash would not have happened", the prosecution said. Five rail managers deny manslaughter and health and safety charges. Prosecutor Richard Lissack told the jury on Tuesday how a broken piece of track 48 miles north of London's King's Cross station - near to the crash site - had been found and repaired during 1999. Following this incident, a series of safety recommendations were set out in an urgent letter from Railtrack head of track David Ventry. One of the defendants, Nicholas Jefferies - civil engineer for Balfour Beatty Rail Maintenance, the company responsible for track repairs - had a "clear duty" to act on the recommendations, the prosecution said. Mr Jefferies, described as Balfour Beatty's most senior person and "the mind of the company", failed to "assimilate, assess and understand" the letter, the court heard. The court had already heard that the faulty rail at the Hatfield crash site was identified 21 months before the derailment but left unrepaired. Mr Lissack said that under the guidelines of Mr Ventry's letter, a 20mph speed limit should have been imposed and the track repaired in 36 hours. Mr Lissack added: "Had the Ventry guidelines been properly applied, the crash would not have happened." Another Balfour Beatty employee, Anthony Walker, is charged with manslaughter, while the company faces a charge of corporate manslaughter, which it denies. 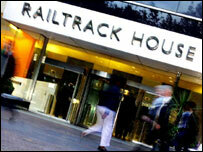 The other defendants, Alistair Cook, Sean Fugill and Keith Lea, worked for Railtrack, which owned the east cost mainline. Earlier, the prosecutor had told the jurors how there were rules set down to deal with track replacement. On Monday, the court heard the men had agreed months before the crash that the deadline for overdue repairs needed on the line would be reset. Mr Lissack said Mr Walker and Mr Lea met in June 2000 to discuss the "long-standing backlog of faults" on the line. He told the court the men had agreed that the clock which counted the time for carrying out all the overdue repairs would be turned back to zero. Railtrack went into administration soon after the crash as inspections and repairs to other lines caused chaos to services. Network Rail took over control of the line. Steve Arthur, 46, from Pease Pottage, West Sussex; Peter Monkhouse, 50, of Headingley, Leeds; Leslie Gray, 43, of Tuxford, Nottingham; and Robert James Alcorn, 37, of Auckland, New Zealand were killed in the derailment.